Home / Blog / FAQs / Cycling or walking the Camino? Cycling or walking the Camino? that is a question we get asked quite a lot! To give you an idea approximately 10% of all ‘Compostela’ certificates are issued to bike-pilgrims or ‘bicigrinos’; while most other pilgrims choose to make their way to Santiago the traditional way: on foot. A small percentage will choose other means, such as horse back. If you are considering cycling the Camino de Santiago instead of walking, bear in mind we generally recommend cycling only if you cycle regularly and if you are familiar with basic bike maintenance. While some people might think ‘doing the Camino’ by bike might make the journey easier, this will only be the case if you have some cycling experience. Most of our Camino de Santiago cycling itineraries cover double the amount of kms than our walking itineraries: typically a Camino cycling itinerary will include an average of 45-70kms per day; while the Camino walking itineraries would cover between 15-25kms. However, you can also choose to travel the Camino walking itinerary by bike, covering the average walking distances. This is a great option for families with children, as the distances will be more manageable and enjoyable for both big and little pilgrims. Another element to keep in mind is the social aspect of the Camino de Santiago, particularly the French Way or Camino Francés. Walking will be a more sociable experience, so if you are keen to meet new people and interact with pilgrims along the way, walking will be a better option for you. You might also like to read: cycling the Camino – how it works. 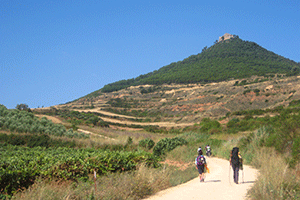 Ask our travel specialists for the best walking and cycling Camino options. Hi Mette, thank you for your question. The French Way is the most popular route and a lot of people would opt to cycle this route too. If you haven’t done the Camino before this is a great route to begin with. The first of this route over the Pyrenees is quite difficult but if you wanted you could start from Ponferrada and cycle to Santiago which would take you over 200kms. Here is more information on this route – http://caminoways.com/ways/french-way-camino-frances/french-way-section-2-cycling Once you have decided on dates I would recommend reaching out to our travel team that will be able to suggest the right route. You can contact them at info@caminoways.com Kindest regards, Lisa. We are a family, who, would LIKE to bile The Camino. Which one is The easiest and which one is The most difficult one? You might need a little more than 5 or 6 days if you want to complete the full route. If you have any further questions do not hesitate to get in touch. Best wishes, Lisa. Hi , my husband and I are wanting to do about 5 or 6 days of cycling the camin from portugeaus costal side. My husband is an experience cyclist but I am only a beginner. Do you advice this or should we rather walk as my fitness level is not that good . Or could we cycle and walk ? Look forward to hearing from you ASAP as we going in mid August this year. Hi Catherine, you could easily cycle from Bilbao to Santander: http://caminoways.com/ways/northern-way-camino-del-norte/northern-way-section-2; following the walking itinerary with a bike and covering from 10 to 33kms per day over 5 cycling days. The full cycling itinerary for section 1 of the Northern Way covers from 30kms to 55kms per day, see here: http://caminoways.com/ways/northern-way-camino-del-norte#tabs-cycling. You could definitely cycle for a few days and take the bus to your next destination. Let us know if you need any additional information or an itinerary/quote. Kind regards.